An exhibition of drawings from the National Archives of Ireland at the Irish Architectural Archive to mark the 250th anniversary of the creation of Merrion Square. In 1745 the foundation stone was laid for the new town house of James FitzGerald, Earl of Kildare. Kildare House – renamed Leinster House in 1766 when the Earl became Duke of Leinster – was designed by Richard Castle as a country house in town, a building whose size and grandeur would reflect the power and prestige of its owner. The entrance front of the new house faced onto the recently laid out Molesworth Street while the garden front looked east across enclosed grounds bounded by a narrow roadway known as Merrion Lane to an expanse of undeveloped land belonging to Viscount Fitzwilliam of Merrion. A friend is supposed to have observed to the Earl that his new house was located in a decidedly unfashionable area of the city, to which FitzGerald replied, ‘They will follow me wherever I go’. It was Viscount Fitzwilliam and his land agents who would ensure that the Earl of Kildare’s prophecy came true. Taking advantage of the opportunity presented by the construction of Leinster House, the Fitzwilliam Estate began to encourage development on Merrion Lane, now elevated to the status of ‘Street’. Although ‘Merryon Sq’ is listed in Fitzwilliam rent rolls from 1752, indicating that a square of some description was in contemplation from this date, the Estate’s approach remained piecemeal and unhurried for the remainder of the 1750s. John Rocque’s map of Dublin shows the relative lack of progress by 1760. 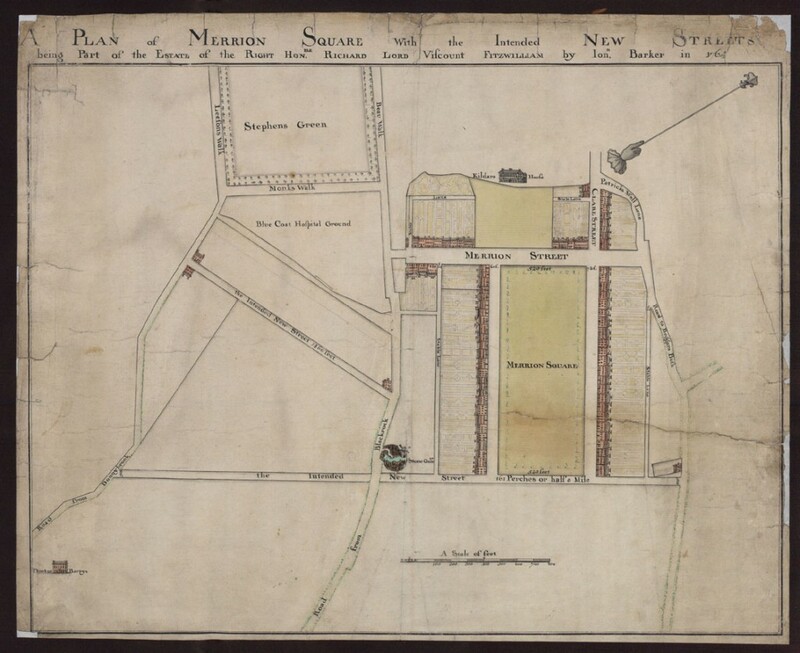 Fitzwilliam ambitions eventually crystallised into the laying out of a bold new urban development, a large and imposing square, first drawn by Jonathan Barker in a survey dated 1762. On 25 March of that year the Estate leased five plots at the western end of the north side of this newly delineated development for the purpose of building houses. Merrion Square was born. 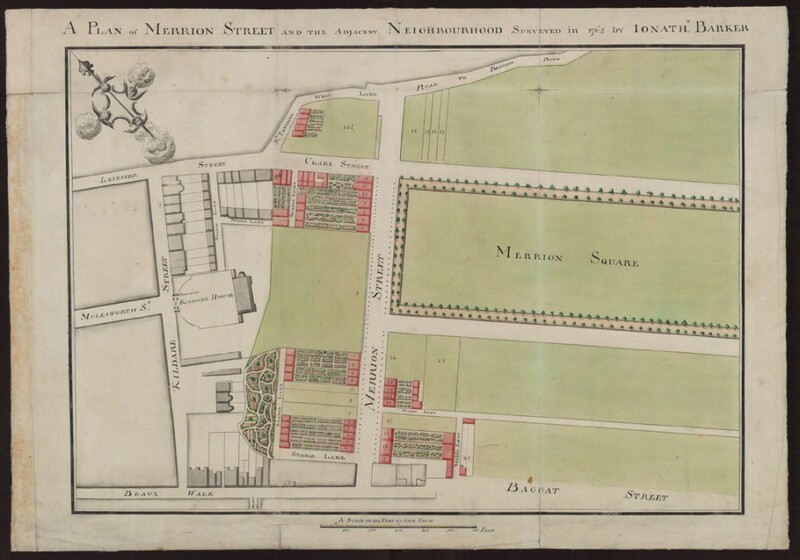 ‘A Plan of Merrion Street and the adjacent Neighbourhood’ Jonathan Barker, 1762. National Archives Pembroke Estate Papers 2011/2/2/8. 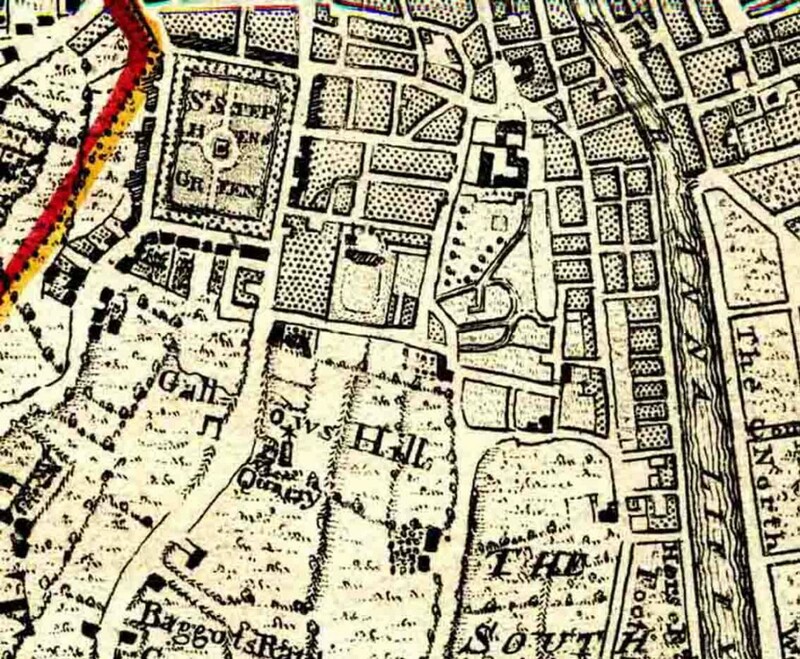 Barker produced two further plans of the Square, the first, dated 1764, showing the north and south sides apparently complete and the second depicting a fully developed square and a new road, the nascent Fitzwilliam Street. In reality progress was far slower than these idealised portrayals suggested. Beginning in 1762 at the west end of the north side, the Fitzwilliam Estate leased plots on the Square to speculative builders and developers, stipulating that houses were to be built on the plots and setting out broad parameters for those houses in terms of materials and minimum heights. Plots were released in strict sequence to prevent cherry-picking and avoid gaps, but the design of individual houses was left to each lessee. With a ready supply of building material from the brickfields at Sandymount and increasing demand for houses in the area, especially after the elevation of the Earl of Kildare to a dukedom, steady progress was made. The north side was completed by the mid 1780s and the east side begun, with the south side following, through the 1790s. ‘A Plan of Merrion Square with the Intended New Streets', Jonathan Barker, 1764. National Archives Pembroke Estate Papers 2011/2/2/9. The Fitzwilliam lands on which Merrion Square was built were but the northernmost tip of a vast estate stretching across south Dublin to Wicklow. These holdings were also described by Barker in a series of maps dated 1762 and would be the subject of further ambitions and highly profitable development by the Fitzwilliams and their successors, the Earls of Pembroke, over the course of the nineteenth century. 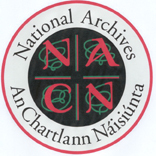 The Irish Architectural Archive is very grateful to the National Archives of Ireland and the National Archives Advisory Council for lending drawings from the Pembroke Estate Papers for this exhibition. The Irish Architectural Archive is also grateful for the support provided for this exhibition by Fáilte Ireland. The exhibition runs in the Architectural Gallery at the Irish Architectural Archive from 24 August to 12 October 2012. The exhibition is accompanied by a lecture series. For more information see here.